Ahh, I remember when the sky used to be pale blue all day, you could go outside without a dozen coats on and be able to sip water from a mountain stream without first needing a pickaxe to break through the foot of ice on top. It was last weekend. This medium-sized blighter has probably got all eight of his furry gloves on about now, and is warming himself up with the thought of all the little children he’ll scare in the coming weeks as he scuttles across their floors. Sorry. I thought I saw something. Anyway, this thing looks quite sinister, with it’s white cross on it’s back, as if on some sort of religious pilgrimage to free all sinners from their souls as it injects them with poisonous venom. 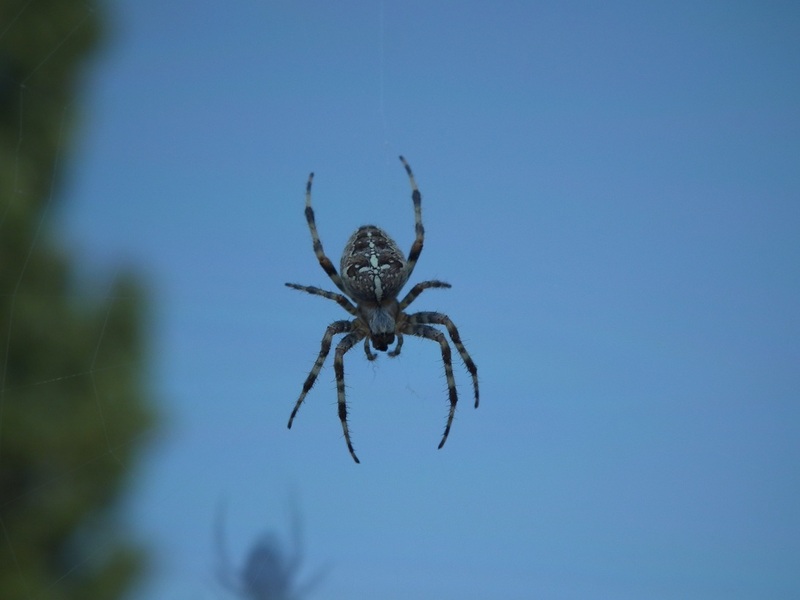 A little research tells me it’s actually a normal garden spider, just one with clearer than usual markings on it’s back. I bet all the other garden spiders are jealous. Scaryness: 7. Only medium-sized, but angular and suspiciously patterned enough to make you think that it belongs in a zoo somewhere, behind double-thick glass and a velvet rope beyond which you MUST NOT CROSS.